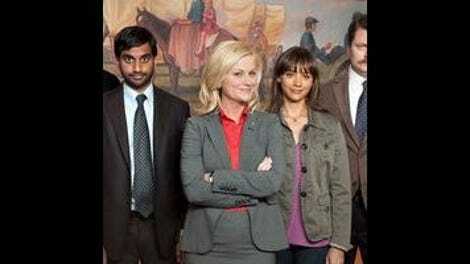 The beauty of Parks & Recreation is that it’s actually a very simple show at its core. Forget everything you know about Leslie’s cursed political campaign, Ron’s deep love of brunettes and breakfast food, the mythology behind the Pawnee vs. Eagleton feud, and the brief but wonderful run of Entertainment 720. Those are all like spokes on a wheel that radiate from a clear and concise vision: A ragtag group of misfits prevail by helping one another. As long as there’s life in Parks, there are going to be a lot of different riffs on similar themes and ideas. “The Comeback Kid” was an episode that wasn’t all that different from those that came before it, like “Telethon,” where the parks department comes together to help Leslie raise money late at night/early in the morning. But because the core concept of the show is so well defined, the writers can keep finding new and interesting ways to tell its stories. Good comedy, and creativity really, is born out of limitations. One of the things I’m not really digging over at The Office is that now, without a barnstorming character to hang most of the stories on, the show has become a sandbox where anybody can play and has played. It’s just that some characters are built into the DNA of that show as bit players; some demand larger parts. When there was more structure to The Office, there was pressure to dig deeper into the format they’d established and keep swinging for the fences. Not so much anymore: Sure, let’s do most of an episode about Meredith, and let Dwight do pretty much whatever he wants because if you’re watching the show, you probably already like him. I don’t get that sense with Parks & Rec, especially not after “The Comeback Kid.” The episode raised the stakes of what sort of disaster these guys are capable of when they work together, and how gracefully they can save everything after it all falls apart. Or, gracelessly, if it means more comedy. Before the holiday break, we learned that Leslie would be running her own campaign, along with the help of the parks department, after the campaign advisors deemed her unelectable. Now we get to see what that actually looks like, and it’s just what I’m sure we all imagined. Ann is Leslie’s righthand woman simply by default. Ron is apathetic except for matters of driving large trucks and constructing stages out of wood. Same goes for Tom, but his topics of excitement include red carpet anything, including shoes. Andy and April do what they can to further their own agenda (in this case it’s procuring a three-legged dog named Champion), and they accidentally find themselves being helpful. Jerry actually does his job and wears a stylin' Hawaiian shirt while doing it. Missing from the equation, of course, is Ben. He resigned from his job when he found out his relationship with Leslie might jeopardize her position in the government, and now he’s stuck at home while Leslie goes off and does something he legitimately could help with. And Ben’s a high-strung guy, so in the absence of purpose, he creates his own—to the extreme. He buys a book called Did Somebody Say Calzone? and begins scheming about a fast food calzone empire called Lo Cal Calzone Zone that will surely take the entire world by storm. He teaches himself claymation and begins work on what will surely be his opus, “Requiem For A Tuesday.” He’s surely having a nervous breakdown. Luckily, Chris is able to swing by and provide some much needed perspective. For the last few episodes, Chris has been forced by circumstances to play the bad guy. He feels terrible the entire time (he even tearfully embraces Ben in private), but he’s the boss of everybody, and his job required he be tough but fair. Now we see the other side of Chris—the goofy yet nurturing side that can barely remember the time he acted sternly to Ben. Now he’s just visiting as a concerned friend whose reactions to Ben’s madness, often expressed in his confessional segments, further heighten the severity of Ben’s situation. Chris might be the microchip, but he’s also served as the rock in Ben’s life for a long time; his visit, and consequently his belt-tasting herb drink, lets Ben know that there’s only so far he’s going to be able to fall before someone is going to catch him. It’s a lesson Leslie learns on her own after a much longer, higher stakes flop. The set-up for her big campaign announcement seems simple enough. They need to rent a gym, build a stage, lay down some red carpet to make a flashy entrance, procure a tasteful banner, and deliver a speech to a crowd of eager Pawnee-ans. Everyone sets off to help, and things are going fine until Ron gets pulled over while driving the supplies back to the gym. Because he doesn’t have a commercial license, the team is forced to load up a much smaller (and product placement-y) car with whatever they can get their hands on, and head ot the gym anyways. Now the stage is much smaller, the banner is cut off at just the eyes of Leslie’s face—“windows are the eyes to the house”—and the red carpet only reaches about one third of the way to the stage. Oh yeah, and April wasn’t really listening while booking the gym, so she didn’t hear them tell her that it had been converted to a hockey rink. The episode was written by longtime Simpsons scribe Mike Scully, and it’s easy to see a lot of that show’s mania in the final act of “The Comeback Kid.” The ill-fated campaign announcement is just a cacophony of awkwardness, and every little detail adds to the madness. First the team proudly struts down the red carpet only to realize it doesn’t go all the way. So they start walking really slowly so as not to slip on the ice. Andy full-on falls over. Meanwhile, “Get On Your Feet” keeps starting and stopping, leaving long stretches of silence as Champion pees all over Ron. The song starts again, and Leslie grins broadly, pointing to the audience and waving like the Mitt-est of Romneys. Then, when they finally reach the stage, the gang is forced to not so much lift Leslie onto the miniscule stage, but hoist her as they struggle to maintain their footing. The song starts again; Leslie snaps into a smile. Finally, the speech starts, and because Leslie fell so much, her cards are entirely out of order. Yeah, it was a bust of a meeting. But this ragtag group of misfits pulled off something truly spectacular on the shoulders of each other—at one point literally. (Plus it might not happen again, now that Ben is taking up as campaign manager.) It’s a story I’ve seen a lot of times on Parks & Rec, but the show manages to tell it more gracefully each time. I'm glad they addressed the elephant in the room right at the start: No, they can't talk about campaign matters at work, nor can they operate out of the parks office. "Don't listen to your head or your heart; just look into my eyes and say yes." Another great small moment: Leslie psyching her team up in the locker room, and Andy just sitting there, casually wearing a hockey mask.